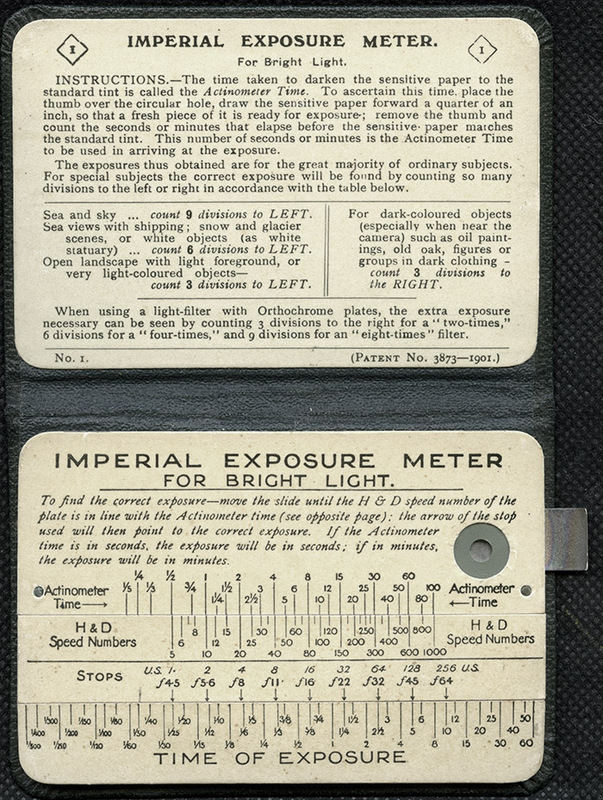 The little booklet is an Imperial Exposure Meter, it’s what photographers used to determine the exposure settings before photoelectric and electronic light meters existed. 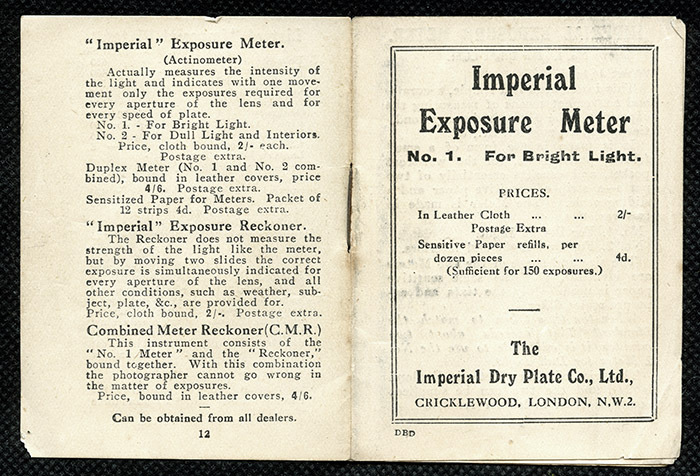 It was manufactured by Imperial Dry Plate Company Limited of Cricklewood England which was founded in the early 1890’s by J.J. Ackworth and in 1918 became part of the Ilford Group (but retained the ‘Imperial’ branding). It is made from card and cloth and bound as a book, early models had a flowing script on the front cover, later models had a block typeface and split the range into a No.1 Bright Light (green cover) and a No.2 Dull Light (blue cover). The two could be purchased bound together known as the Duplex. 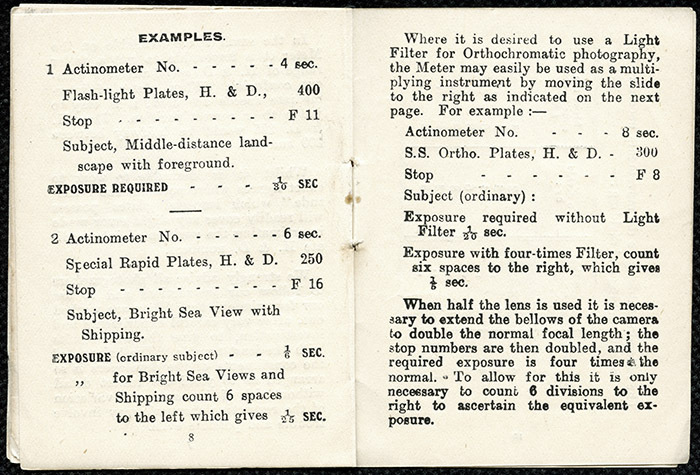 As the meter booklets were pocket-sized (70mm x 98mm) it was not possible to include all practical light levels and still be able to read the graduations in a single table. Inside my copy is a small printed instruction booklet which I’ve also included here; it quotes the price as 2/- (two shillings) which dates mine at about 1924 (90 years old) as they were originally priced at 1/-. 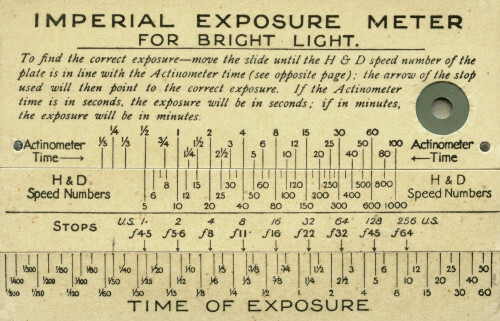 The Actinometer, a sort of slide-rule, refers to the actinic or chemical intensity of light as opposed to radiometric or photometric amount of light. First, under subdued lighting conditions, a new strip of sensitive paper was loaded into the slot in the meter. Next, the left thumb is placed over the little round window and about ¼” of new paper was pulled out. 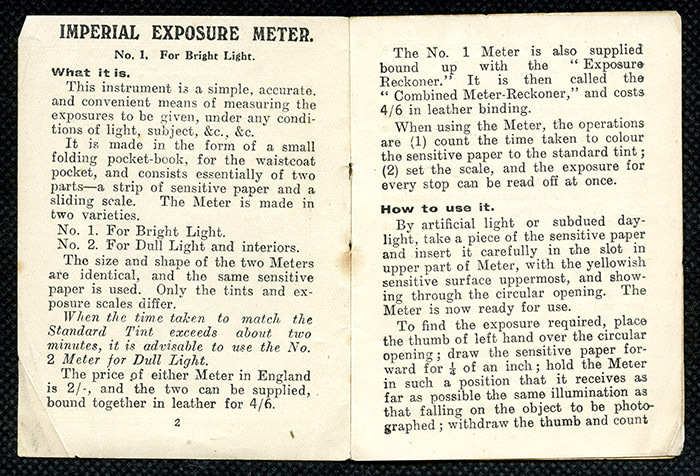 The meter was held in such as position that it received, as far as possible, the same illumination as that falling on the subject to be photographed. 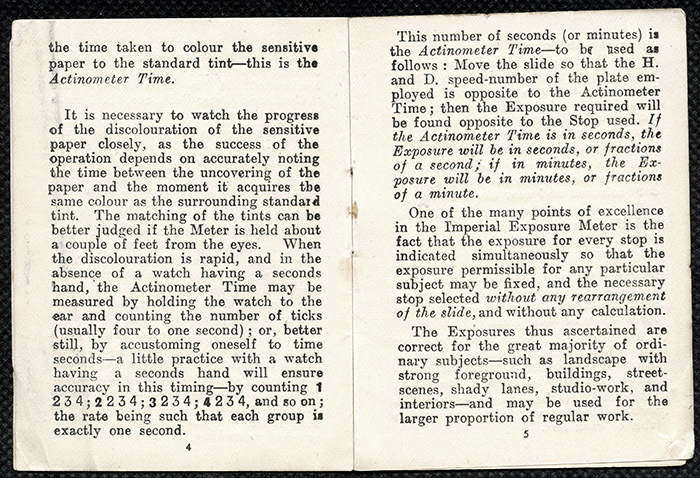 The thumb covering the light sensitive paper was lifted and the photographer started to count the time it took for it to change colour to the same as the standard tint – this was the Actinometer Time. 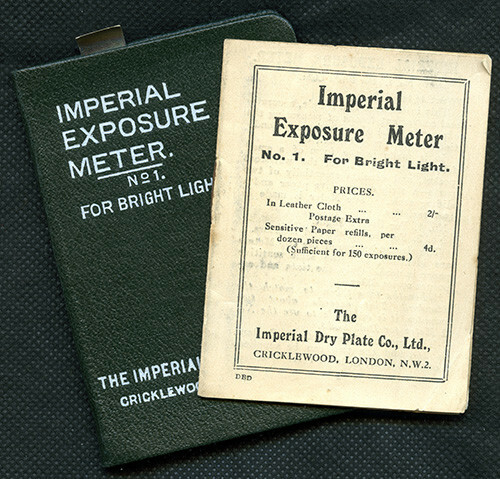 Thus this meter is an incident light meter rather than a reflected light meter which is the mechanism used in modern cameras. It is interesting to read on page four of the printed instructions as it asks the photographer to practice counting time 1 2 3 4; 2 2 3 4; 3 2 3 4; 4 2 3 4; being a drummer, I do this all the time! 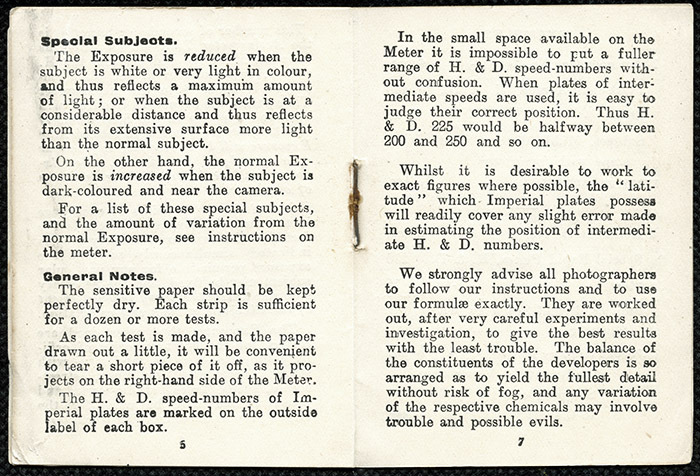 H&D refers to Hurter and Driffield; scientists of the nineteenth-century, who brought quantitative sensitometry and densitometry methods to photography. They received the Progress Medal from the Royal Photographic Society in 1898. In the H&D system, Speed Numbers were inversely proportional to the exposure required in the same way that ISO is today. So for example, an emulsion rated at H&D 20 would require 10 times more exposure than one with H&D of 200. This H&D system was officially accepted as the standard in the former Soviet Union from 1928 to 1951 when it was superseded by GOST 2817-50. These are full-stops, that is to say, the interval between these gradations is one photographic stop. Modern cameras might have half-stop or even third-stop divisions. 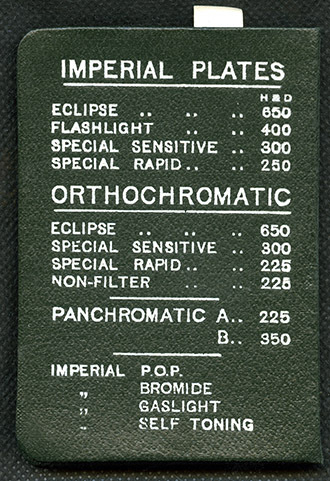 The last row of data is what the photographer finally needs to correctly expose the emulsion on the plate having first selected an aperture, and that is the exposure time. 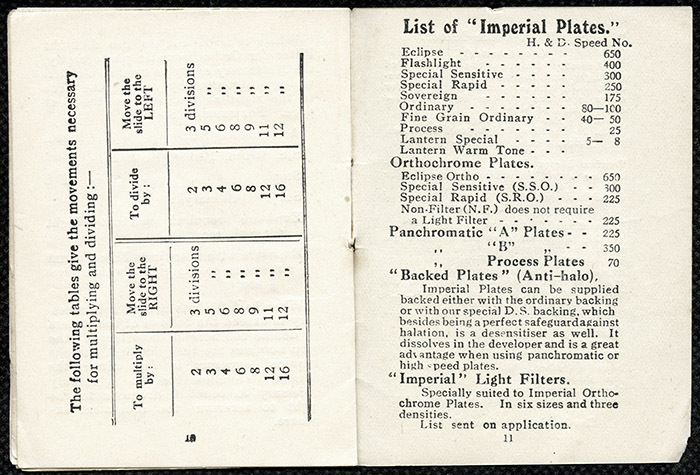 Let us suppose we are using a reasonably sensitive dry plate from the Imperial range. 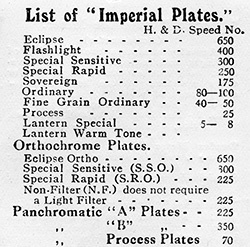 From the instruction booklet we can see that the ‘Special Rapid’ plate has an H&D speed of 250. After we’ve set up the camera and subject, opened the aperture to its widest setting to allow more light to fall on the focussing screen, we can then focus the camera under our dark-cloth. We then close the aperture to the desired setting (lets assume f/32), close the shutter, then load the camera with the dry emulsion plate. We are now all set, but need to know the time of exposure for this plate’s speed at the selected aperture. Now we simply read off the time of exposure against the selected aperture. So in this case at f/32 we have a shutter speed of 3/8 second. 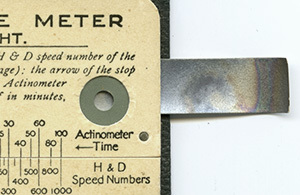 Note that the linear distances on the meter between aperture ticks (one full stop) are the same and that these also correspond to the same linear distance of the major ticks on the Actinometer and Time of Exposure scales for a doubling of time. 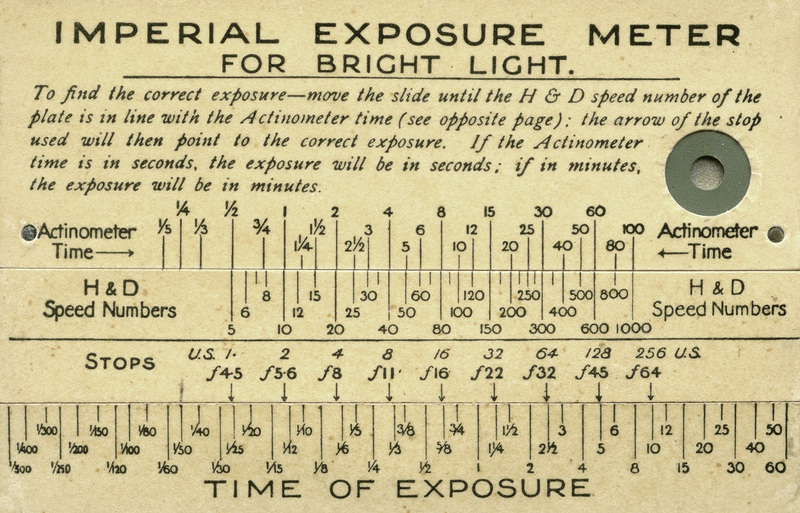 The minor ticks on the Time of Exposure scale are about 1/3 stops apart and the linear distances between these minor ticks are not quite 1/3 stop because they have been rounded to sensible proper fractions. It is interesting to compare the H&D Speeds in the table above to a modern day ISO scale. 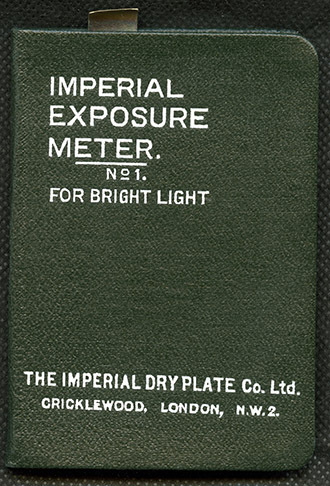 A typical Imperial dry plate with an H&D Speed of 250 (‘Special Rapid‘) equates to an ISO of 6. The fastest H&D Speed in the table is 650 (‘Eclipse‘) which equates to an ISO of 16, this is still about 3 stops slower than ISO 100 our modern day ‘slow’ film/sensor.